We wanted to take a bike tour, so we woke up early on Friday, but it was still raining as we finished up breakfast so we decided to postpone it a day. Instead, we visited the gold museum and then tried to hike up Monserrate for the third time. The climate in Bogotá is cool. The city lies at around 8,000 feet and is surrounded by mountains, but you warm up substantially while walking up all the hills. It makes it hard to pick what to wear, and we were constantly either shedding or adding layers. It was just after 3pm, and the hike to the top is about 5 kilometers. The sun doesn’t set until 6, and we wanted to check out the sunset from the top. We had more than enough time to make it before it got dark, but when we arrived at the gate at the bottom of the walking path, the police informed us that it closed at 2pm. 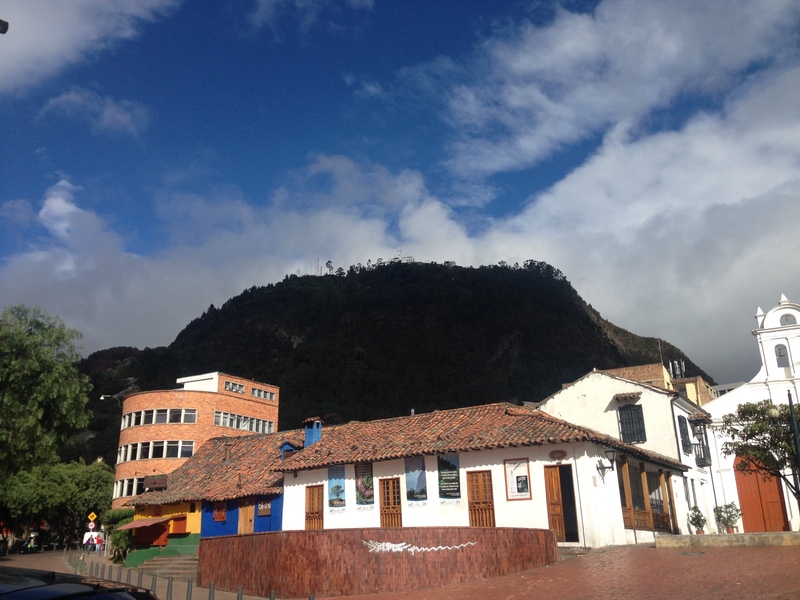 This is where we began our bike tour, in the Candelaria just a few blocks from our hostel. We still wanted to take a bike tour, but the tour starts every day at 10:30 and ends at 2:30, so we would have to try once more to hike Monserrate on Sunday if we did the bike tour on Saturday. Sunday is when Ciclovia happens every week, so it would be a pretty active day if we were to bike around the city in the morning and get to the mountain before 2pm to hike, but it was our last day in Bogotá, so we had to try to squeeze it all in. Our bike tour on Saturday was what we really should have done on Tuesday, our first day in Bogotá, to learn about the city and get a good idea of where we wanted to check out in more depth (and learn what we probably should avoid). Our tour guide led us along with another expat couple living in Peru and a German man through the streets of Bogotá for four hours, stopping at various points to explain the history of what we were seeing. We stopped at a local market to try some popular Colombian fruits and at a coffee roaster to try some of the coffee that gets exported from Colombia. Most Colombians drink cheap instant coffee, while all the good beans get exported to other countries. There is government-funded graffiti everywhere in Bogotá, and it all has a meaning. The story of the graffiti was most interesting to me. All around the city you can see beautiful, colorful murals. Graffiti used to be illegal, but some of the artists got together and formed collectives to demonstrate that their art actually adds beauty to the city and can communicate social or political messages. Eventually, the government, tired of wasting resources to lock these people up and paint over their work instead of focusing on more dangerous criminals, had a change of heart and actually started supporting the graffiti artists. Now there are paintings all over the city that are financially backed by the government, all with a political or social message to share with the public. A similar story was told to us during our bike tour in Medellin, where we also saw many colorful graffiti murals. I think this model should be adopted everywhere, along with Ciclovia. During Ciclovia you can find all sorts of people enjoying the streets without car traffic. Cyclists, pedestrians/runners, street vendors/performers and dogs dominate the roads from 7 to 2 every week. Ciclovia was started in the late 1990’s by mayor Enrique Peñalosa, who was actually born in the US. Over 100 kilometers of roads are shut off to cars every Sunday from 7am to 2pm in an effort to entice people to be more active. With a feeling of safety in the streets, Ciclovia now attracts around 2 million people every week. They come out on their bikes, inline skates, on foot, with their dogs, with their running clubs, and with every level of intensity from recreational stroller to athletic guys in spandex on carbon race bikes. People sell food, offer bike repair services, give dance lessons and perform in the street – there’s something for everyone on every block, and you could spend all day riding and still not see it all. The real downside to Bogotá (and Cartagena and Medellin) is the air pollution. From the moment we stepped out of the airport we could smell diesel fumes from all the traffic. It’s sometimes so bad that I physically couldn’t breathe in. It’s not a good environment for intense physical activity, but outside of the city I imagine the mountain air is relatively fresh and clean. 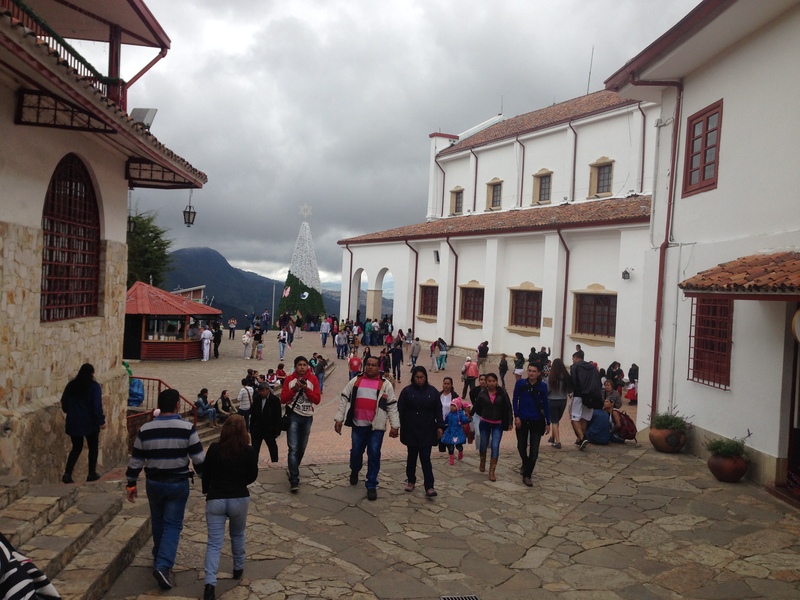 Here is the plaza around the church on top of Monserrate. The view from Monserrate includes the entire city of Bogotá.